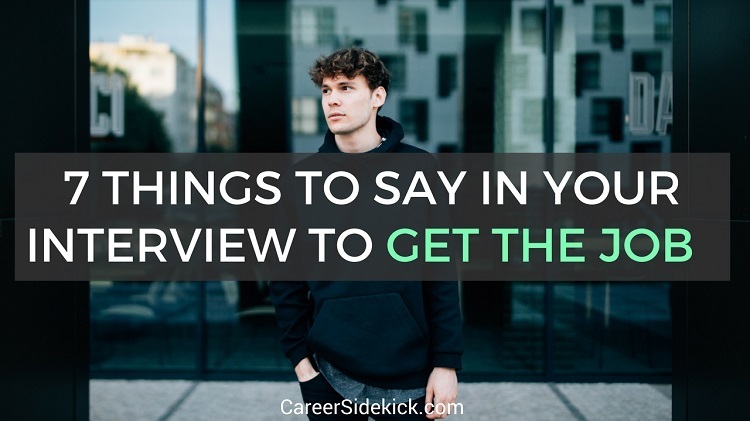 If you want to have a great interview and get hired by top companies, there are certain things you should make sure to say before you leave the interview, and these are the top 7 things you should say to impress them and “check all the boxes” they’re looking for… so you can get hired faster. It’s crucial to show you’ve done your research before the interview. Why? A lot of job seekers apply to many companies without knowing anything about them. They’re desperate and don’t really care, and companies can tell! So if you want to stand out and get hired for great jobs, you need to show that you understand the job and company, and you have real reasons for wanting to interview at this particular job. The bottom line: If you seem like you’ll take any job you can find, you will be very unlikely to find any job). They might also ask something like, “how did you find out about this position?”. It’s not a trick question, but they just want to know how you’re finding companies to apply to, etc. This is the next thing to say if you want to have a great interview and get the job. You want to be able to explain specific things you’re looking for in your next position. Show them you understand their job, and how it fits into what YOU want. This will convince them that you’ll enjoy the job, work hard, and stay a long time (these are things employers care a TON about. Most job seekers don’t realize how important these things are, and it’s something I go into detail in, in my job interview answers guide. Also, be prepared to explain why you left your previous job. They’re very likely to ask. Asking questions is extremely important in any interview – from a first call with a recruiter, to a final face-to-face interview. Why? This shows employers you care about what type of job you take, and you care about your career. And its hows you’re being careful in your job search, which they love. Giving great answers will not save you if you don’t ask any questions of your own, which is why the questions YOU bring are as important as anything else you say in an interview to get the job. So try to ask 2-3 questions to each person you speak to in an interview. Ask about the company, the group, and most importantly – the job itself. Here’s a list of over 100 great questions to ask in the interview. Studies on persuasion have shown that “You” is one of the most powerful words you can use in any conversation. Why? It shows you’re not just focused on yourself, but thinking about the other person’s needs and what they want. In an interview, this will add to your credibility and make them trust you, and is one of the best ways to make sure you have a great interview and get the job. See how you’re answering their question by talking about your skills, but then turning it around and talking about their needs and focusing it on them? Most job seekers think the interview is all about them – their skills, experiences, qualifications. And how they answer the interviewer’s questions. The most successful job seekers realize the interview is about the employer and THEIR needs. So focus on their goals, concerns, and needs when you give your interview answers, and you’ll get more job offers (and for better jobs). Always show how your skills will help them. Share past examples and stories of how you’ve accomplished similar tasks to what this employer needs/wants, etc. Everyone knows that the employer wants to see if you can do the work, but they also want to make sure this is a job you’ll actually like. So saying something to indicate you’re interested in this type of work is crucial, and one of the most important things to say in your job interview to get hired. No employer will hire you if they have those concerns! So don’t just show you can do the work – show them that this type of work is something that excites you. This is true about the specific job you’re interviewing for, and also the type of work in general. One of the biggest things employers look for: How quickly you can get “up to speed” and start contributing and producing work for them. They want proof of this. Past examples of similar work you’ve done, or similar challenges you’ve overcome. It doesn’t matter if you’re looking for your first job after college, or job searching with 30 years of experience…. if you want to get more job offers, show them it will take you very little time to start being a productive member of their team! And explain why. You need to give proof. Saying things like, “I’m a fast learner in general,” is NOT convincing (every job seeker says this and hiring managers are tired of hearing this). …Even if you’re not applying for a leadership job. …Even if you’re not managing anyone (and never have). Why? Because they want someone who can grow in their organization. And someone who can lead projects and take initiative in their individual work. Leadership isn’t only useful if you manage people directly. You can step up when your boss needs you to handle an emergency. Or you can just take initiative in your own work and accomplish as much as possible without outside help. That’s a form of leadership too! So as you prepare for your interview, think about one or two examples of times you’ve led. A project, a team, a task, anything. If you just graduated, pick a school project. But have something! This is why a lot of employers are going to ask: “Tell me about your leadership style,” or other similar questions. It’s something they care about a lot. If you follow the advice above you will get hired faster and avoid having bad interviews. It’s not about copying these exact phrases though – try to understand why employers want to hear each phrase (or a similar phrase), and then customize it and make it your own! And if you want more help with what to tell employers to get hired faster, I recently put together a complete guide to job interview answers with my best tips and strategies to land you a better job faster. You can get the details HERE.